Abstract: Dive computers model the uptake and release of nitrogen in a diver’s tissues and are used routinely to monitor decompression status in terms of the allowable time a diver may stay at any particular depth. Since the first appearance of multi–level decompression computers on the sports diving market in 1983, significant progress has been made towards improving divers’ safety. This has been done principally by presenting decompression information such as dive time, no decompression stop time, depths at which decompression stops are made, repeat dive profiles, permissible and safe ascent rates, and other vital parameters such as air time remaining and air supply pressure. The latest models can provide an accurate dive profile (depth against time) after the dive, a facility that is considered an important diagnostic aid after a decompression accident. 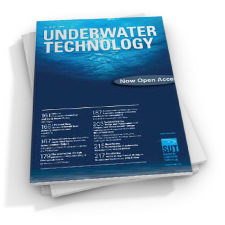 This paper considers the historical development of dive computers, how they work, how they differ in design, what features they offer and how divers’ expectations now make challenging demands upon manufacturers in terms of technical feasibility, ergonomic acceptability and human–computer interaction. The new generation of dive computers will integrate conventional decompression computations with high resolution data–logging, environmental and physiological monitoring and extra functions such as underwater navigation capability. Abstract: This paper provides an introduction to the issues surrounding and impacting upon the design of control systems for Remotely Operated Vehicles (ROVs). The unique characteristics of ROVs are discussed from a control viewpoint, and methods are proposed for minimising the control problem at the design stage. Mathematical modelling is briefly covered, and a brief tutorial–style review is given of current and proposed control techniques for use with ROVs. Abstract: There is a scarcity of data relating to the hydrodynamic loading due to sacrificial anodes. A method of calculating factors to apply to circular cylinder force coefficients, using the discrete vortex method is described. The results are presented for uni–directional and oscillatory flows. Equivalent force coefficients are calculated and used in a Morison–type analysis of a simple jacket structure in a current and in waves. The overall in–line loading was found to be increased by as much as 9% in modest environmental conditions. 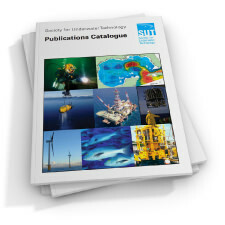 Abstract: This paper describes a Subsea Powered Autonomous Remote Control System (SPARCS) which is designed to control subsea wells without the use of electrohydraulic control umbilicals. With oil exploration moving towards marginal fields, and small fields connected to the existing infrastructure, SPARCS will provide a low cost solution for control of subsea developments. This paper looks at each of the main system components and provides commercial justification for such a control system. SPARCS is highly innovative in that it controls hydrocarbon wellheads without the use of control umbilicals. The system’s electrical power subsea is produced by a turbine generator fitted to a water injection flowline or alternatively a thermo–electric generator fitted to a production flowline. Hydraulic power for operating wellhead and downhole safety valves is produced from a subsea unit. Communication signals for valve control and sensor monitoring use acoustic telemetry with seawater as the transfer medium. 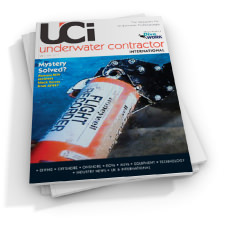 Abstract: The increasing demand for aggregates to supply the construction industry has resulted in an expanding marine dredging industry, and sand and gravel dredging now represents some 25% of total annual supplies. This paper considers the history and development of offshore dredging, geological and technical considerations, licence procedures and problems, and the future of the offshore aggregate industry. Abstract: Global wave loads measured on the Tern platform during a very severe storm have been compared with predictions made on the basis of three different models for wave kinematics. The first is the ‘Newwave’ theory, a broadbanded, probabilistic–based model for the extreme waves of a random seastate. The second model involves complex time–domain simulation of random directional seas. Both these theories are used with the Morison equation and realistic force coefficients to predict global forces. The third wave model is the Stokes fifth–order theory with artificial values for the force coefficients, as used in conventional design practice. Both the Newwave theory and the random directional simulations lead to predicted base shear forces that are comparable to the measured values over a wide range. If non–linear effects in the ocean surface are accounted for, then the Newwave theory predicts the base shear generated by the largest wave of the storm with a very high degree of accuracy. In contrast, calculations based on the Stokes kinematics of conventional design practice overpredict the measured loads over the whole range studied. It appears that Newwave is the most suitable available wave theory for routine use in the design and analysis of structures such as Tern. Abstract: There are about 3000 employed or university graduate student scientific divers in the European Community, and probably as many again with the status of undergraduate students who occasionally dive for research purposes or as voluntary assistants. There is an additional population of amateur volunteers. The number of scientific divers in the other European countries is not so clear, but probably a further 30–50%. There are many ways in which scientific diving could benefit from various kinds of collaboration between European countries, and possibly from research funding or infrastructural funding on the European scale. The UK has a good track record in international collaboration, although recent changes in legislation have made it difficult for foreign scientific divers to come and work in the UK. The scientific diving community in the UK is one of the largest in Europe, and one of the best organised, although the demise of the Underwater Association was a serious blow. Experience and ability in the UK will enable British scientific divers to play a strong role in European collaboration and large scale projects, and this situation should be developed to the full. With our long coastline and extremely varied coastal conditions it would be sensible to offer British research diving facilities as convenient service sites for scientific research groups from throughout Europe, but this is not possible at present because of the legislation. 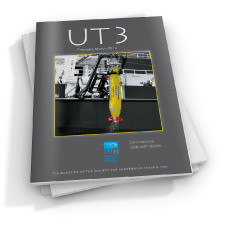 The Society for Underwater Technology (SUT) has an important potential role in attracting scientific divers so as to promote the community activities and membership participation in this field. 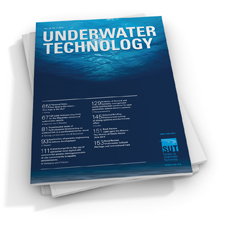 Abstract: A theoretical study has been made of the seabed terrain–following ability of a towfish, fitted with a seabed–sensing sonar and active controls. Single cable and twin cable (with depressor) configurations have been compared and the effects of wave–induced towship motion have been included. The results indicate that satisfactory terrain–following can be achieved, but that the anticipated advantages of the twin cable arrangement are not necessarily realised in practice because of motion coupling via depressor surge. Abstract: We have developed a mathematical model of inert gas uptake and distribution based on the physiological characteristics of the human body. Using the inert gas levels calculated by the model we have calculated total gas content of each tissue type taking account of metabolic gas exchange. When the total gas pressure is greater than environmental pressure a bubble forms; the model calculates the change of volume of this separated gas phase. These calculations are repeated at frequent intervals throughout the decompression procedure. Thus, we have predictions of separated gas phase volume for any tissue of the body, at any point of the path from arterial blood to venous blood and tissue oxygen levels. We have run this model to predict gas phase volume for a number of decompressions, carried out with pigs and with humans, in which we have used ultrasonic bubble detection. The agreement between predicted separated gas volume and bubble count is very good. The model enables us to examine the effect on bubble formation of changing major characteristics of the decompression profile. Thus, we can begin to plan profiles with minimum bubble formation and compare predictions with bubble counts in pigs. Ultimately we should be able to design bubble–free decompressions – but perhaps we are being too optimistic. Abstract: This paper investigates the parametric excitation of suspended loads during crane vessel operations. Determination of the system’s behaviour is achieved by a time domain numerical integration of the equations of motion. Growth of large amplitude oscillations of the suspended crane load is shown to occur in monochromatic and random sea states. Results are presented and discussed in relation to their practical significance, and also to gain insight into the interesting characteristics of the non–linear, parametric equations of motion. Tidal Stream Power for Orkney and Shetland? Marine resource atlases provide a means of bringing together, in a convenient form for reference and planning purposes, the multiple uses of a sea area. Digital versions – Geographic–Information Systems (GIS) – are now the rule rather than the exception and span the wide spectra of both users’ needs and technical development respectively. The current situation in the United Kingdom, the Netherlands, Italy, North America, Food and Agriculture Organisation (FAO) of the UK and within the Private Consultancy area are described in turn and then the key question of whether or not decision–makers per se should manipulate data within a GIS–context is discussed. It is suggested that technical advances over the next 3–5 yeras will make such a development inevitable and that this must be taken account of by marine resource atlas–makers. Abstract: There is now extensive published evidence, based both on measurements and visual observations, that average wave heights over the North East Atlantic have increased moderately to considerably over the past two decades and this is also seemingly true for the North Sea. This article reviews the available evidence and the implications for the design of marine structures. In particular it notes that such increases in average height could have a substantial influence on fatigue loads affecting existing as well as future structures. It therefore recommends further investigations, particular continued monitoring of the trend in wave climate to improve the general understanding of long term trends in weather severity and further research into the reasons for these trends. Abstract: This paper details the findings of an investigation into the condition of the Cormorant CA–P1 Satellite Tree on recovery from the North Sea after eleven years of service as an oil and gas producer. During this time the tree required no major workover operations, with the exception of a tree cap replacement. The primary objective of the inspection work performed on the P1 tree was to investigate the general condition of key components and mechanisms after 11 years of continuous service. Areas of particular interest were: the corrosion protection system, metal to metal seals and sealing surfaces, elastomer seals and sealing surfaces, gate valves and operators, alloy materials, the ‘Y’ spool and crown plug arrangement, and hydraulic control lines and couplers (tree to tree cap). Additionally, the main block, flow loops and production flowlines were non–destructively examined for any loss of wall thickness, due to erosion/corrosion effects. The paper concludes that the equipment performed well and makes recommendations on design and operational procedures for future subsea satellite production systems.